in their new quest of family life. I have referrals to prove it. Your $200 deposit reserves the puppy of your choice! Scroll down to see what we were blessed with. This is a photo of Louette (Tri-colored white, black and brown) and of Ida (black, gray and pointed silver creme). Both of my girls weigh 10-11 lbs and are in excellent condition. They are happy, healthy family pets with good . bites (teeth alignment), and beautiful faces. 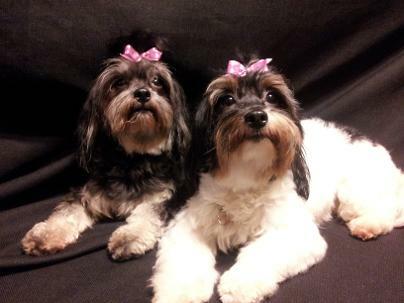 Notice their plush full coats and of course they have that wonderful Havanese temperament ! Please don't become offended as I inquire information from you regarding adopting a Silver Harbor Puppies. I love these puppies dearly as they are a part of our family. We celebrated their births and celebrate again as they begin their new life opportunities as well. Thank you for choosing a Silver Harbor Havanese! I can not hold puppy from other prospective buyers. While waiting for the deposit your puppy will be classified as on HOLD until money is received, after which your puppy will be marked as RESERVED until they are old enough and able to join your family. All deposits are $200 minimum and are non refundable. Please remember you have chosen a well bred Havanese and are not going to be disappointed. Also your puppy is guaranteed! Because of color changing and growth I can not guarantee coloring. All puppies come from AKC registered stock and are sold only as pets. I welcome all questions and concerns. I do not sell to breeders. All Puppies will be sold without registered breeding rights. I am thankful to have blessed my beautiful puppies with very good family homes. It has been a pleasure and very rewarding to have seen such happiness and satisfaction on people's faces when they have found their puppy. Check out our previous shots and poses on our 'Puppies at home with 'new family' tab. Video is from Past litter in 2013.